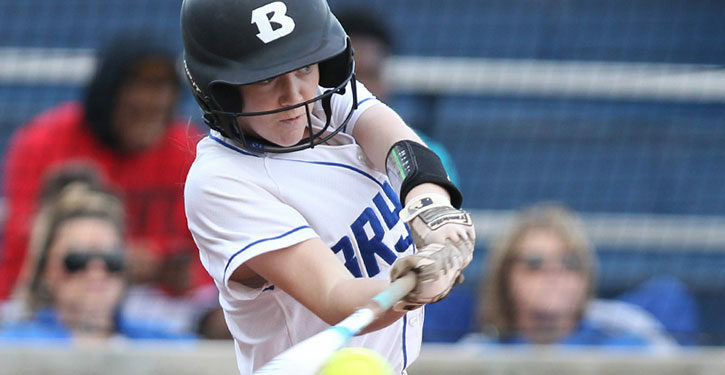 With one out in the bottom of the seventh, Meagan Chism, who homered earlier, dashed home on a grounder to short by Raven Loveless and beat the throw to the plate to cap off the Bryant Lady Hornets’ thrilling come-from-behind victory over the 2017 Class 3A State runner-up Bald Knob Lady Bulldogs at the Lady Hornets’ Yard on Monday night. The 6-5 win improved Bryant’s record to 2-0 going into the annual Drew Melton Tournament in Benton this weekend. The Lady Hornets will open play Friday at 4:30 p.m., against De Queen, the defending Class 5A State champion last year. “This was a good test for us,” said Lady Hornets head coach Lisa Dreher, whose team won easily over Sylvan Hills in a pre-season scrimmage and in their opener against Lake Hamilton. “I was proud of their response to Bald Knob coming out and putting up three runs on us in the first inning. We needed to feel that intensity going into the Drew Melton tournament this weekend. We may see them again there if we both win our first two games. “Our offense was able to pick up the slack where we struggled pitching,” she continued. “We had a lot of hard hits right at the defense. The Lady Hornets were set back on their heels in that first when Bald Knob’s second batter, Hannah Smith belted a homer and, after Madi Pierce singled, Janna Smith cracked another round-tripper to make it 3-0 with two out. A walk and an error followed before Chism picked off the lead runner to end the inning. To start the home second, Regan Ryan walked and, getting a bunt down, Gianni Hulett reached on an error, the first of five for Bald Knob. But they turned a doubleplay to take the starch out of the inning. After the rugged first inning, Loveless setting down in the pitching circle in the second and worked around a two-out single to keep it 3-0. In turn, the Lady Hornets rallied to tie in the bottom half. With one out, Brooklyn Trammell’s grounder to second drew an errant throw to first. Trammell wound up at second. Maddie Thompson blooped a fly to right and, when the throw in came to the plate to hold Trammell, she hustled to second. Bella Herring was hit by a pitch and the bases were loaded. With one out, Ryan yanked a single to right that drove home two. Hulett greeted a new pitcher with a base hit to left brought in Herring with the tying run but when Ryan tried to follow her home, she was thrown out to end the inning. Hulett then took her turn pitching and retired the side in order in the top of the third, striking out two. In the home third, Chism hit the first pitch for her home run to snap the tie. The Lady Bulldogs’ Kinlee Varnell managed a one-out single in the top of the fourth but Chism picked her off first moments before Hulett struck out Rylee Curd to end the inning. Desite hits from Herring and Ryan, the Lady Hornets were unable to add to their lead in the home fourth and, in the top of the fifth, Bald Knob picked up a tying run on consecutive singles by Anna Bradley, Grace Pickens and Hanna Smith. An error had runners at second and third when Hulett returned to relieve Loveless. After a strikeout of Pierce, Chism fired a strike to third to pick off Pickens who took off for home and was tagged out on the return throw from Loveless from third. Kynlee Brimer struck out and the game went to the bottom of the fifth tied 4-4. The first two Lady Hornets were set down but Loveless beat out an infield hit then scored all the way from first on a double over the center-fielder’s head off Trammell’s bat. Bald Knob threatened to tie it back up in the top of the sixth. Janna Smith singled and Erin Thomason sacrificed her to second. Varnell singled to left but the ball was hit too sharply for Smith to score. She held at third. Varnell took second to put the potential lead run in scoring position but Hulett struck out Curd and got Bradley to pop out to Herring at second. To start the home sixth, Herring singled up the middle. With one out, Ryan bunted her to second, but she was stranded there. An error opened the door for the Lady Bulldogs in the top of the seventh but Chism threw Pickens out as she tried to steal second. That proved fortuitous when Hanna Smith stepped in and drilled her second home run of the game to tie the game. Loveless issued a walk to Pierce but then stepped up with a strikeout of Brimer. Janna Smith drew a free pass but Loveless struck out Thomason to keep it 5-5. Chism opened the bottom of the fifth with a hard grounder to Thomason at third. An error allowed Chism to not only reach safely but the reach second. Sarah Evans got her to third with a grounder to the right side, setting the stage for the winning dash from third on Loveless’ grounder to Hannah Smith at short.